Pc Optimizer Pro is the PUP that uses misleading techniques to prevent removal. Use Reimage to locate malicious components and get rid of them faster than with uninstall instructions. A full system scan blocks virus reappearance and prevents traffic to malicious domains. PC Optimizer Pro is a rogue system optimizer which is often classified as malware. This virus claims to be legitimate program, which is capable of increasing security of the system and protecting computer. Nevertheless, you should not take these words for granted because they are very misleading and may even lead you to the loss of your money. PC Optimizer Pro is related to another program called Fake Antivirus. These products are FAKE and you should never buy them. Yes, that's what they seek. How do they do that? In most of the cases, they rely on misleading tactics that seek to scare PC users and then to make them purchase their full or licensed versions. That's why this program starts scanning the system as soon as it gets installed on the system. Usually, it spreads via software bundling, so it is likely that you won't remember the moment it got installed. After hijacking the system, PC Optimizer Pro virus states that some of the legal and essential Windows files are infected. In order to get ability to remove them, you are supposed to purchase its licensed version. If you are still not convinced to remove the described scareware program, we want to suggest reading PC Optimizer Pro reviews online. You will find dozens of forums discussing questionable functionalities of the software. Besides, you can even find some YouTube videos with recorded conversations with the rogue program's “support” team. We believe that user reviews and these videos will convince you to uninstall PC Optimizer Pro – we are not the only ones who claim that the software is rogue and highly untrustworthy. According to dieviren.de, many German-speaking computer users got their computers compromised by this rogue system tool. 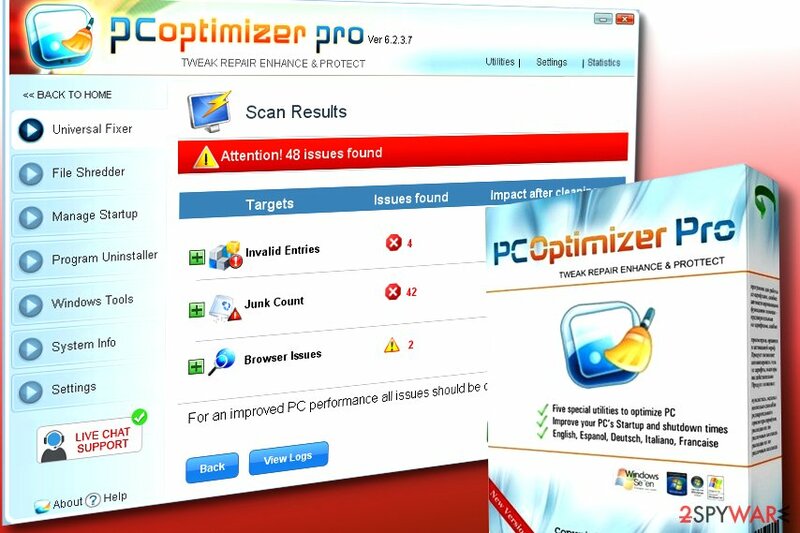 PC Optimizer Pro pretends to be a useful system optimization and maintenance tool while in reality it is a rogue software that urges victims to buy its licensed version. Screenshot of PC Optimizer Pro bogus scan results. 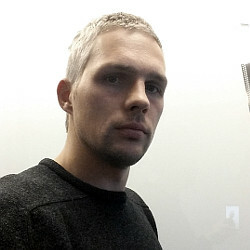 This described rogue program is mostly distributed through infected websites and through the use of other dangerous computer programs. Below, you can find some tips that will help you to avoid installing it on your system. In order to avoid it, you have to stay away from illegal websites and download updated anti-spyware, which could help you to detect all suspicious programs before their infiltration. Finally, we would like to recommend you avoiding fake alerts that are either trying to check your computer for free or to update some of your programs. You can encounter such pop-ups and ads on certain web pages while browsing the web. Once this PC optimizer Pro enters computer, it may try to block other applications on your computer and tell that they are infected. In addition, this program may try to change browser settings, connect itself to the internet, stay resident in the background and block access to legitimate anti-virus and anti-spyware programs. Unfortunately, PC Optimizer Pro removal process is quite a difficult task, so if you do not have enough knowledge of the computer system, it is better to remove this virus automatically. Question. I have just found a suspicious system optimizer on my computer and I know that I have never installed it. Could this be that PC Optimizer Pro is a virus that infiltrated my computer behind my back? PC Optimizer Pro is a seriously deceptive application, which seeks to swindle people's money. It is known that it has been spread similarly to other fake optimizers, what means that there is no surprise that it showed up on your computer without downloading it. Typically, such programs are spread using fake pop-up ads, software bundles, trojans and other deceptive methods. If you have just discovered that optimizer on your computer, don't waste your time and scan your computer with updated anti-spyware because it can easily cause additional problems on your computer. We recommend suing automatic removal of this shady optimization tool. Question. As soon as I turn on my computer, PC Optimizer Pro scanner starts checking my computer. Typically, it finds several hundreds of PC errors and other issues. However, I can't fix them without purchasing this program. Should I do that? Please, do NOT pay for PC Optimizer Pro malware because it's a fake computer optimization tool! If you really want to check your computer for issues, you should download a other reputable anti-spyware because PC OptimizerPro is a fake optimizer that is seeking the only thing – swindle people's money. In order to protect your computer and data that you keep on it, you should eliminate this program from your computer. Question. Help me, I am infected with a virus! I googled “What is PC Optimizer Pro” and now I know that it's a dangerous program but I don't know how to delete it. Could you give me a detailed guide for the full removal of PCOptimizerPro? Yes, you are infected with a seriously suspicious program, which should never be purchased. If you want to remove PC Optimizer Pro and each of its file, you should download a trustworthy anti-spyware like Reimage. Make sure you update it before running a full system scan and you will remove each of malicious files that are related to the virus. Question. I was browsing on the Internet when a huge warning message showed up. It offered me to check my computer for errors and I clicked on it. Now I am suffering from PC Optimizer Pro alerts offering me to purchase its license. The main problem is that I can't remove this malware because it fails to appear in Programs list. Unfortunately, but you have been tricked by hackers who are using such deceptive technique for spreading their viruses. In this case, you should run a full system scan with updated anti-spyware and remove malicious files from it. If you want to be sure that PC Optimizer Pro is not hiding in your system's background, you should perform a system scan using a reputable security product. Question. Could you help me to figure out whether PC Optimizer Pro is malicious or not? I was going to purchase its license for improving my computer's performance. Please, do NOT pay for PC Optimizer Pro's license because it's a fake system optimization tool! No matter what is promised by its developers, they are promoting a useless program, which can even be used for stealing personal people's information. If you want to protect yourself, you should eliminate PCOptimizerPro from your computer. You can do that with the help of Reimage. If you think you are infected with the described system optimization “virus” but you do not know how to remove PC Optimizer Pro properly, we suggest you follow the instructions provided below. For a faster and easier removal, run a full system scan with Reimage, Malwarebytes MalwarebytesCombo Cleaner or Plumbytes Anti-MalwareMalwarebytes Malwarebytes. These programs will help you to get rid of all malicious files that can be found on your computer. If you decided to go for manual PC Optimizer Pro removal option, remember that this won't guarantee that all suspicious files and dangerous programs will leave your computer. However, you must follow the steps provided below to obliterate the shady software for good. Click 'Start' and select 'Control Panel. Click 'Uninstall a Program' under 'Programs'. Choose 'PC Optimizer Pro' and select the 'Uninstall/Change' option. Click 'Yes' and 'OK' to save the changes. Here, look for Pc Optimizer Pro or any other recently installed suspicious programs. Wait until you see Applications folder and look for Pc Optimizer Pro or any other suspicious programs on it. Now right click on every of such entries and select Move to Trash. When in the new window, check Delete personal settings and select Reset again to complete Pc Optimizer Pro removal. Once these steps are finished, Pc Optimizer Pro should be removed from your Microsoft Edge browser. Here, select Pc Optimizer Pro and other questionable plugins. Click Remove to delete these entries. Now you will see Reset Firefox to its default state message with Reset Firefox button. Click this button for several times and complete Pc Optimizer Pro removal. Get rid of every Chrome extension that slipped into your browser without your knowledge. Here, select Pc Optimizer Pro and other malicious plugins and select trash icon to delete these entries. Click Reset to confirm this action and complete Pc Optimizer Pro removal. Here, select Extensions and look for Pc Optimizer Pro or other suspicious entries. Click on the Uninstall button to get rid each of them. Now you will see a detailed dialog window filled with reset options. All of those options are usually checked, but you can specify which of them you want to reset. Click the Reset button to complete Pc Optimizer Pro removal process. ^ Malware: What it Means, Common Types, & How to Deal With It. Lifewire. Tech Untangled. This entry was posted on 2017-08-15 at 10:24 and is filed under Malware, Viruses. How did you remove Pc Optimizer Pro?